Leading U.S. manufacturing indices suggested modest expansion in business activity in December 2012. 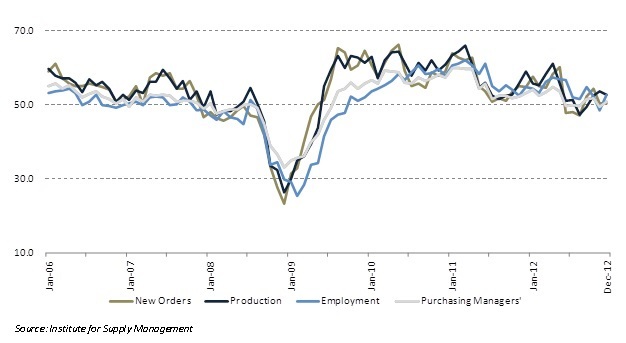 The Purchasing Manager Index (PMI), New Orders Index, Production Index and Employment Index all registered above 50% in December 2012. Of note, the New Order Index remained at 50.3%, indicating growth in new orders for the fourth consecutive month. The Chinese PMI rose to a 19-month high of 51.5 in December 2012, reflecting continued expansion in China’s manufacturing sector. The American Taxpayer Relief Act, which was signed into law on January 2, 2013 to avert the so-called “fiscal cliff”, extends 50% bonus depreciation through 2013. Some transportation and longer period production property is eligible for 50% bonus depreciation through 2014. Also, the top tax rate on capital gains and dividends was raised to 20% for taxpayers with incomes over $400,000 (single person) or $450,000 (joint filers). The maximum 15% rate was retained for all other taxpayers.